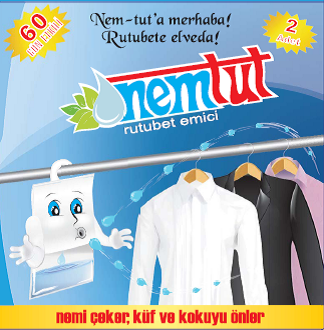 NEM-TUT is specially designed to prevent mould and stench caused by excessive humidity in closed areas. By virtue of its hanger design, it can be used practically in your wardrobe, bathroom, laundry, storage, basement and garages. Accumulates moisture in its own body for two weeks and later in the bag under it. Moisture filling can easily be observed. Depending on the moisture condition of the applied environment, the average life span of the product is 60 days. By using it at any kind of place; home, garage, depot, workplace, wardrobe, bathroom, laundry, cellar, car and boat, you can remove moisture and damages caused by it. Open the protective polyethylene cover of NEM-TUT package you took out from the box. Hang NEM-TUT to the appropriate area where you want to apply. When the package content completely died down, replace with new one. Throw away the used up NEM-TUT package. Wash your hands with water.